Meet your newest wardrobe staple: the metallic pump. 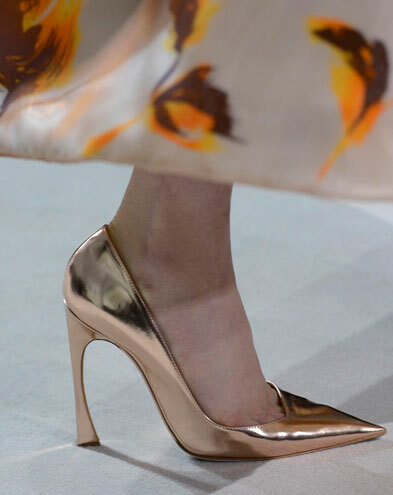 Fashion's heaviest hitters, including Christian Dior, (pictured above) Chloe, Balmain, and Lanvin, all featured iterations of the shiny shoe in their Spring 2013 collections, prompted perhaps by the steely hue's neutral-like versatility and glamorous statement-making power. Check out these dazzlers from Vince Camuto, Edmundo Castillo, Alice + Olivia and, J. Crew. For a more subtle take on the trend, try these Diane Von Furstenberg sandals (on crazy sale!). Whose shoe is the one in the photo? It is Christian Dior Spring 2013--coming soon! !